Did you know that colored Russian eggs have been given as gifts in Russia for more than a millennium? It’s true! Since the egg itself is a symbol of new life, it is a perfect gift for a family with a newborn. There are numerous eggs in the store collection that represent Mary and baby Jesus, which would be very appropriate while being a statement of your faith. But don’t think that eggs are just for babies: young adults to older adults will find them to be a very surprising and delightful gift as well. For instance, in the distant past, young girls have given colored eggs to young men they fancied. 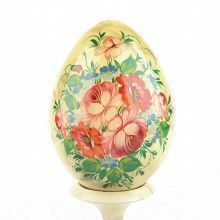 The tradition of presenting colored eggs has always been thought through, from the color and design of the egg to the personality of the happy beneficiary. There was believed to be a certain color code: eggs with predominantly white backgrounds and simple designs were given to younger people, whose life represented a blank page, while eggs with darker colors and more intricate designs were presented to older people, whose lives were already "filled" with events. Red symbolizes love, yellow-harvest, green-wealth, and blue was associated with health. Even if you don’t keep to those traditions, any Russian egg is still going to be a perfect gift for nearly any occasion. 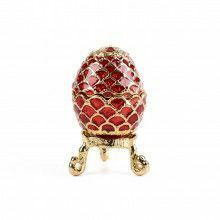 Easter time however is the most popular, as Carl Faberge started this trend 150 years ago. 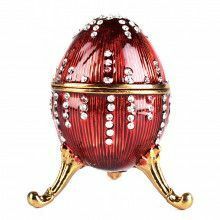 Tsar Alexander III ordered an Easter egg for his wife, Maria Fyodorovna, and apparently she was so pleased with what her Easter bunny brought her that Faberge was promoted to be the royal jeweler. Every year he produced a fabulous egg and every egg ordered for the tsar family had to have a surprise in it (and as no one likes old surprises, Carl had to think of a new one every year). The ingenious jeweler always replied: "Your majesty will be pleased." His masterpieces made him one of the most famous people in the world. One of his eggs – the Rothschild egg – was auctioned in 2007 for $18.5 million. That’s how the Russian eggs roll. 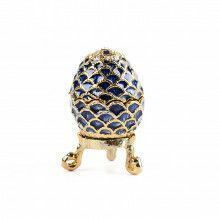 Faberge eggs are fab for Easter! So are other Russian eggs! Stand out this year with different, fun, interesting, and/or religious Russian eggs! 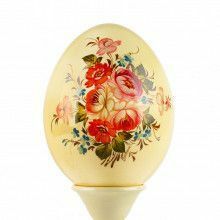 There is lots to love with egg trinket boxes. Studded with shiny crystals and made for a display as well as practical use for holding small mementos, they especially stand out on Easter day. They make unique gifts that children can respect, are excellent conversation starters for young adults, and are admired by collectors of all ages. 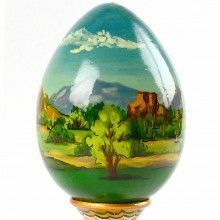 The Russian Store has egg nesting dolls, egg ornaments, wooden eggs (with stands), pisanki Easter eggs, pewter-based egg trinket boxes, fine crystal eggs, and even faberge egg pendants! (Easter jewelry has never looked better). Get your egg on this year and every year, all year-long! Go eggs! Some people collect beautiful Russian eggs and put them behind glass and dust them every once in awhile. Our collection is unique and attractive and deserves the attention, but don’t you want to have fun with your collection too? How about a little egg tapping, also known as Easter egg fights. 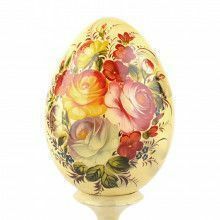 You could be the all-time winner (cheater) with your hand painted wooden egg. Or you could have an egg dance! According to an old tradition, if you needed a parent’s approval for a marriage, a number of eggs were scattered on the floor and remained there for an entire dance. If all the eggs were unharmed, your approval would be granted. There is also another egg dance. In a circle drawn in chalk on the floor is a bowl with an egg in it. Around are scattered little objects like flowers, little toys, and eggshells. The goal is to roll the egg out of the bowl, then flip the bowl over and cover the egg with it. The real catch is that it needs to be done with one’s feet only, not touching the objects around and not going out of the circle. And, of course, keeping the egg undamaged (which in your case will be easy, unless you will want to play with a glass egg – then we retrieve all responsibility for this). You could also be the most stylish egg-roller during Easter. Traditionally children participated in Easter egg rolls, but it’s fun for everyone. The rules vary depending on the country and the traditions, sometimes the winner would be the one rolling their egg the furthest down a slope, and at other times the one breaking the shell of another egg with their egg. Don’t forget to show off your fancy Russian eggs at the Easter Egg Roll on the White House lawn! And of course the good old egg hunt. You can write clues for the kids (and adults) to look for their "treasure," make a map of the house with the eggs locations marked, or just hide them and let the crowd search! This will also make for some surprising moments finding eggs around the house long after Easter is gone.